Bundesliga | A Bundesliga-shaped solution to the USA's travails? A Bundesliga-shaped solution to the USA's travails? 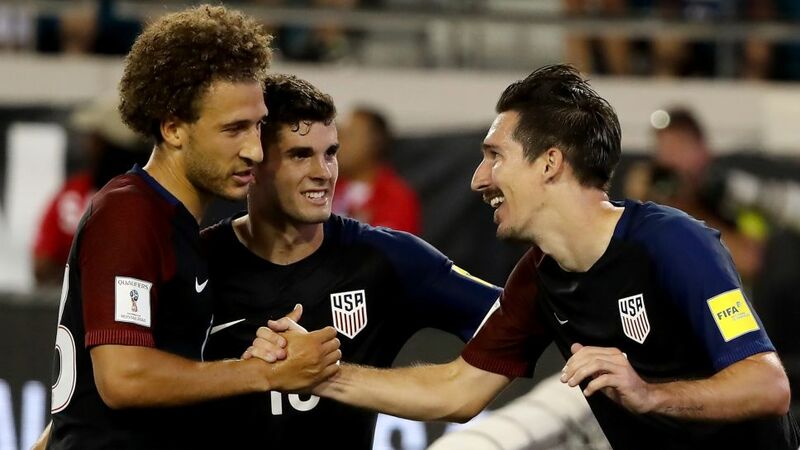 Despite boasting Bundesliga stalwarts like Christian Pulisic, Fabian Johnson and Bobby Wood in their ranks, the USA find themselves fourth in the CONCACAF zone 'Hexagonal' standings with their hopes of reaching the 2018 FIFA World Cup in Russia hanging in the balance. Two wins from eight games is a disappointing return for the Stars and Stripes, but victories in their final pair of qualifying matches would guarantee them an automatic ticket to Russia – and avoid the arduous lottery of an intercontinental play-off with either Syria or Australia from the Asian zone. The fleet-footed Borussia Dortmund starlet is often touted as the saviour of US Soccer and has been handed the role of attacker-in-chief at international level. He has been selected all across the midfield and increasingly in a central position, where he has admittedly proven effective. However, in the Bundesliga he is almost never selected in the middle of the pitch. BVB coach Peter Bosz played him on the left in the Supercup, where he opened the scoring and was arguably the best player against Bayern Munich. Pulisic was also on the left wing in wins against Hamburg (3-0) and Augsburg (2-1). He has played on the right too, as he did in the 3-0 win over Wolfsburg - which saw him win bundesliga.com's inaugural Man of the Mathchday thanks to a goal and an assist - as well as in the 2-0 triumph over Hertha Berlin and the 6-1 thrashing of Borussia Mönchengladbach. Pulisic's work ethic means he is effective helping out defensively, while going forward he can use his pace to take on defenders out wide, or cut inside to shoot or cross. While Pulisic is an elite wide man, there is also doubtless an element of nurturing driving this choice to put him on the flanks – Dortmund and Bosz are renowned as expert youth developers, after all. Given Pulisic's remarkable maturity it is easy to forget that he only recently turned 19 and is still learning his trade. By playing out wide there is less pressure on his young shoulders, which he doesn't need despite his talent. There are still plenty of years left for him to take centre-stage from Clint Dempsey. Poor Fabian Johnson. The Gladbach star is a versatile operator who blends superb tactical awareness with excellent technique and stamina. That has led to him plugging a number of holes with the national team, where he has been deployed as a left midfielder, right midfielder, full-back and wing back over the years. The 29-year-old can do a decent job wherever he is asked to play, but it is telling that for his club the picture is rather different. For the Foals, Johnson is a wide attacker, period. His pace, dribbling ability and awareness of where and when to make a run make him a valuable asset in the final third, while his ability to play off either foot makes him an awkward opponent for defenders, unable to predict which way he will go. Such gifts are wasted in more defensive roles, and any doubters need look no further than his Goal of the Season contender on Matchday 23 in 2016/17for evidence of just how devastating he can be. Given the USA's recent defensive wobbles – they have conceded 11 goals in eight qualifying games - the Eintracht Frankfurt defender must be wondering what he needs to do to be given a decent run-out at international level. The 27-year-old was last included in the squad almost a year ago in Jürgen Klinsmann's final two games in charge: defeats to Mexico and Costa Rica. And yet for Frankfurt he has not missed a single minute of Bundesliga action in 2017/18. The Eagles have soared to eighth place in that time, but Chandler's contribution to a defence that has conceded fewer goals than Bayern Munich this season should not be overlooked. An experienced player with over 170 top-flight matches in Germany under his belt, the Frankfurt native is more mobile than Geoff Cameron, who has been used at right back on occasion. That would allow the more attack-minded DeAndre Yedlin to play in right midfield, a position Arena his selected him in regularly already. Although the USA have scored the joint-highest number of goals in Hexagonal qualifying so far (12), six of those came in a single game against Honduras. That fixture aside, the return of six goals in the remaining seven games is rather underwhelming. Bobby Wood has scored twice, but his partnership up front with Jozy Altidore does not seem to be a fruitful one. Indeed, the three games in which the two of them began together all ended in defeats, with just a single goal scored (by Wood) in those fixtures: a 2-1 defeat to Mexico and the reverses to Costa Rica. At club level, Wood thrives as a lone striker with deeper help coming from the wings. Indeed, the supporting role played by Andre Hahn at Hamburg could conceivably be taken on by Johnson or Pulisic for the USA, giving Wood the freedom to move, create space and get on the end of crosses. The 19-year-old only recently made the step up to senior level with Schalke this season and is perhaps still a little too inexperienced for the national set-up, but the early indications are that he would not be out of his depth. After all, how many of the USMNT's current central midfielders could line-up against a team of the calibre of Bayern Munich and not be outplayed by the likes of Arturo Vidal, Corentin Tolisso and James Rodriguez? McKennie has featured in five of Schalke's Bundesliga games this season, and has even started the last three. A dynamic midfielder with a tidy range of passing who is unafraid to throw himself into the tackle, the Texas native could inherit it Jermaine Jones' place in the national team, just as he looks to be his long-term heir in this Schalke one.